Gold Open Hug Hugging Earrings Rhodolite Garnet Stone 3mm by Fashion Art Jewelry at Nicky's Blog. Hurry! Limited time offer. Offer valid only while supplies last. 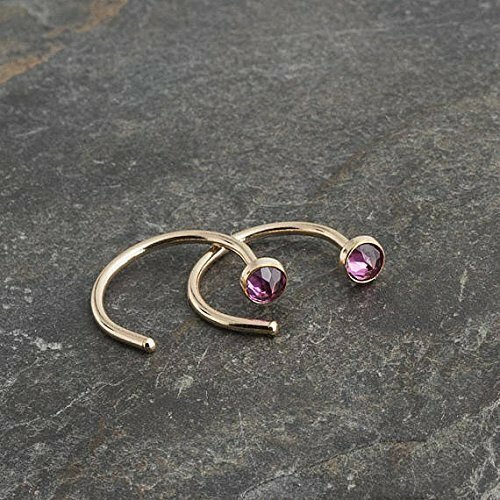 Dainty Rhodolite Garnet Huggling Hoop Earrings in 14K Gold filled with 3mm Rhodolite Garnet hoop earrings - the perfect size for everyday wear. Dainty Rhodolite Garnet Huggling Hoop Earrings in 14K Gold filled with 3mm Rhodolite Garnet hoop earrings - the perfect size for everyday wear. Beautiful 3mm stones are surrounded by a lovely gold filled round setting - little hoops for your ears. All metal is 14K Gold Filled. These delicate hug hoops are made of 1mm - 18 gauge gold filled wire and feature a tiny round 3mm natural Rhodolite Garnet stone. Approximate diameter: 0,4" (13mm). Please note pictures of jewelry are enlarged. The stones used in these earrings are natural. As you can see I'm trying my best to meet your requirements. Please contact me if you feel something is still missing. I'm willing to do anything and everything necessary to your satisfaction.